Description: The 9523 crosses the BNSF tracks at Crystal, MN. Title: CP 9563 ,CEFX 136 ,CP 9523, middle remote CP 9558.. Description: X500 heads east through Trowbridge. This train has been running very late recently due to congestion in Chicago. Description: CP Eastbound Freight Train rumbles past the Amtrak Station in La Crosse, Wi. Description: The trailing GE unit at CP university. Description: Two CP AC44s team up to lift a freight towards the light at Marshall St. Ne. 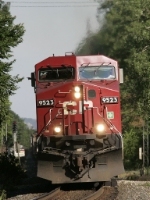 Description: Westbound CP passes Port Haney. 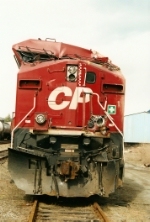 Description: Waiting for CP 9778 to finish work at Galt Yard. Clyde Road 11:45am. Description: CP 9523 is seen on CSAO CA-05 at Westville, NJ.